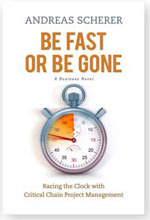 Be Fast or Be Gone has won prizes in the 2012 Eric Hoffer Book Awards and the 2012 Next Generation Indie Book Awards. This important critical chain business novel is available in hardcover or ebook (amazon.com or Barnes and Noble). You may also download a sample. When Mike Knight learns that his eight-year-old son Tim has a rare form of brain cancer, he makes the agonizing decision to quit his job and go to work for Altus Labs, a pharmaceutical company developing a possible treatment. Mike is in for the challenge of his life as he races against time to implement Critical Chain Project Management at Altus Labs. Critical Chain Project Management is an enterprise solution that incorporates methodology and software tools to help organizations move to a relay-race “faster and better” paradigm. Companies that implement the Critical Chain approach routinely experience off-the-chart returns on investment. Dr. Scherer has held several senior executive positions, including at AOL, Netscape, and ProChain. He is the author of three books and numerous international publications. Founder, BioPharmaPM; Partner, Critical Skills Inc.